Provide comfort for the family of Gail Parsons with a meaningful gesture of sympathy. 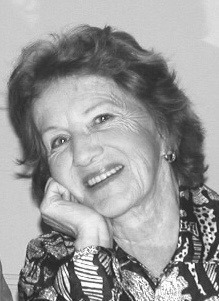 Gail Arlene Parsons passed away peacefully on the 5th of April, 2019, at the age of 83. Gail had been in failing health for some time, but through it all she maintained her playful sense of humor and always enjoyed her evening G&T with her husband, Malcolm. Gail grew up in the small town of Espanola, Ontario, Canada. When she and Malcolm married they began a life of Canadian and overseas travel; Gail always loved the opportunity to live somewhere new. Although naturally shy, Gail made friends wherever she lived: from Saskatchewan to British Columbia to Algeria, England, Australia, Calgary, Libya, Turkey, and finally to Houston, locals and ex-pats alike appreciated her generous smile, tremendous cooking skills and fabulous dinner parties! She had a beautiful soul that drew kindness from strangers and genuine love from friends. Gail is survived by her husband of 62 years, Malcolm; her daughter, Allison and partner Rick; her son Andrew, his wife Katherine and their three children Isabel, Graham and Gordon Parsons. Her second daughter, Janice, passed away in 2011. Gail never liked being the center of attention and, per her wishes, there will be no services. In lieu of flowers, please consider making contributions in memory of Gail Parsons to the Dementia Society of America by mail to PO Box 600, Doylestown, PA 18901, or online at www.DementiaSociety.org/donate. To send flowers to the family of Gail Arlene Parsons (Gibson), please visit our Heartfelt Sympathies Store. Provide comfort for the family of Gail Arlene Parsons (Gibson) by sending flowers.